In order for humanity to survive into the distant future, we need to visit and learn how to survive on other worlds, according to NASA chief Charles Bolden. NASA is in the process of developing technologies that are expected to help humans get to Mars and beyond. Landing astronauts on Mars and even establishing a long-term human presence on the Red Planet is just one step toward learning how to live on a different world, Bolden said during the Humans 2 Mars Summit in Washington, D.C., Tuesday (April 22). This NASA graphic depicts the major steps for NASA on the path to a manned mission to Mars. NASA is aiming to send astronauts on a Mars mission sometime in the 2030s. Ideally, the first crewed mission to Mars will represent the culmination of many incremental steps — like NASA's ambitious plan to retrieve an asteroid and park it near the moon — taken to safely get humans to and from Mars, NASA officials have said. NASA Administrator Charles Bolden delivers the opening keynote address at the Humans to Mars Summit on April 22, 2014 at George Washington University in Washington, DC. Administrator Bolden spoke of NASA's path to the human exploration of Mars during his remarks. Under the space agency's current framework, NASA officials hope to launch humans to Mars by the 2030s after sending an astronaut crew to an asteroid by 2025. "We, today, are Earth-reliant," Bolden said. "We're dependent on being on this planet. We are not a multi-planet species yet … Only multi-planet species survive for long periods of time." In general, the architecture for a mission to Mars is not like the Apollo program that brought astronauts to the moon for the first time. The current plan could involve sending multiple spacecraft to the Mars system over the course of years, however, the plan to get to Mars is an evolving process, William Gerstenmaier, NASA's associate administrator for the agency's human exploration and operations mission directorate, said during the conference today. 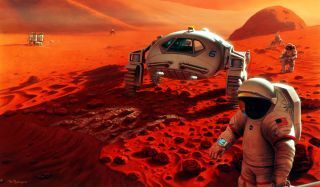 "We're starting to take a different approach toward Mars than we have before," Gerstenmaier said. "Our classic [ideas for Mars] missions were more Apollo-style in a way — where we launched everything within a year and we sent the armada of spacecraft … toward Mars. I think we're going to do that maybe over a period of time, over a period of years and build more of an evolvable piece. "It's not a single mission, but it really is the pioneering aspect," Gerstenmaier added. "Once that mental change starts … and you're looking at it in the long term, then you invest in some things that might actually take longer to go do, but they may be more sustainable." Learning more about Mars also has tangible effects right now, Bolden said. Understanding the Red Planet could also help scientists peer into the past and future of Earth. "Mars' formation and evolution are comparable to Earth’s and we know that at one time Mars had conditions suitable for life," Bolden wrote in a post on Space.com. "What we learn about the Red Planet may tell us more about our own home planet's history and future and help us answer a fundamental human question — does life exist beyond Earth?"